In 2014, the FDA designed a new food safety program that involves sampling specific commodities at point-of-entry to the country, to tackle microbiological contamination at source, or at least discover more data as to the scale of the problem. The sampling is targeted at raw milk cheese aged 60 days, hot peppers, and cucumbers, with the idea that the data collected can be used to help predict and prevent any future corruption. In October, some of their preliminary findings were published, and this article will take a look at their methods and results. Firstly, a little background on the program. Conceived in 2014, testing was implemented beginning November 2015, when the FDA began to collect samples of cucumbers and hot peppers. The sampling takes place Mondays through to Thursdays year-round, and they are collected from ports of entry (where foreign goods are cleared to enter the country), and processing, packaging, and distribution centres across the US. The FDA is aiming to collect 1600 samples each of hot peppers and cucumbers, across a spread of all areas of the supply chain. The samples include all varieties of cucumbers and peppers, wherever they have been grown. Samples are tested for two common foodborne pathogens, Salmonella spp. and E. coli O157:H7. The FDA also intends to test hot peppers for Shiga toxin producing E. coli. Any positive tests lead to genetic analysis to determine the “fingerprint” of the pathogen, which is then be added to a database. The FDA doesn’t notify food companies before surveillance sampling, unless it is being done in a packing house on a farm. The agency is authorised to do this as part of its testing remit, to ensure that testing occurs on samples in their usual environment. If they find a positive sample, they can put out alerts, recalls, or warnings, as well as following up with further inspections. Why Cucumbers and Hot Peppers? 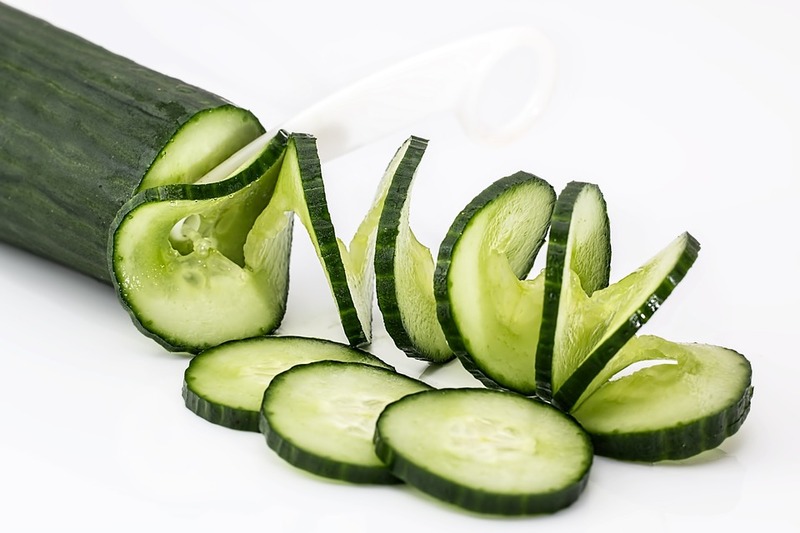 Cucumbers often come into contact with contaminated water, soil, or equipment during the growth, processing, and transport phases. On top of this, they can be exposed to worker contamination if they are harvested and sorted by hand. 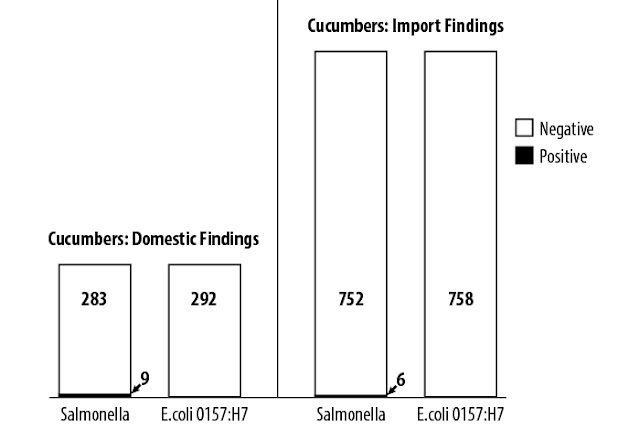 Between 1996 and 2016, there have 6 outbreaks of food poisoning in the US linked to cucumber contamination, with 1243 people affected. 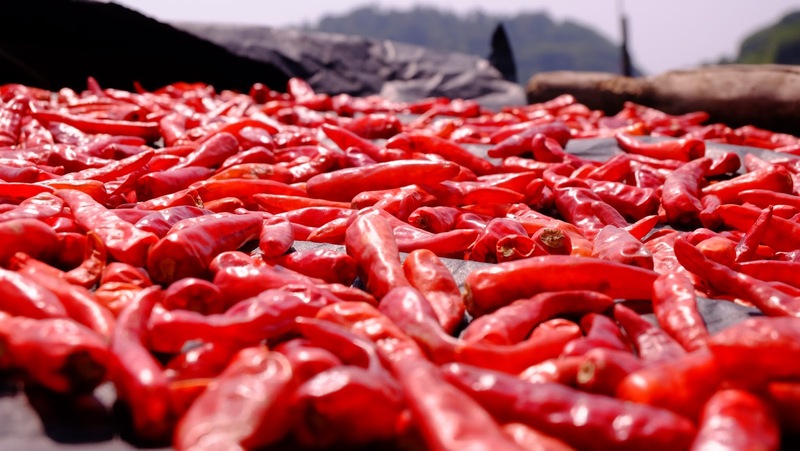 Similarly, hot peppers can also be contaminated by water, soil, equipment, or harvesting activity. In 2008, fresh hot peppers were involved in an outbreak that affected 1810 people, with 2 deaths. 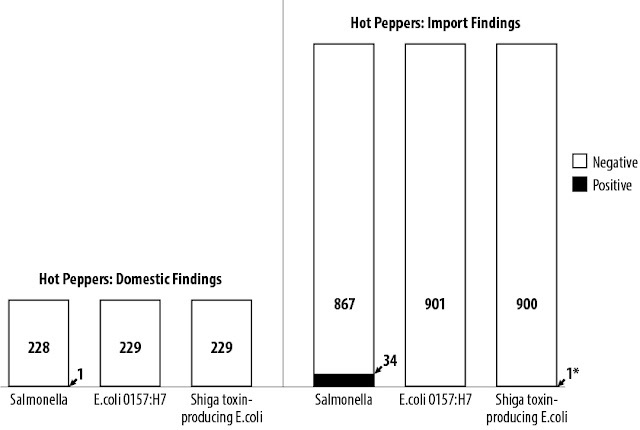 It appears that Salmonella presence in import chilis quite high, which could be a potential red flag in the program’s findings. The findings show that although neither food is in a critical state in terms of the pathogens tested for, with no E.coli whatsoever found thus far, salmonella is still an issue. Hopefully the data the FDA has collected can help it do even more to stamp out food contamination. The agency is keen to point out that as sampling is still underway, no conclusions can be drawn. However, even one incident could lead to illness or worse, so their continued efforts are both laudable and necessary.